It doesn’t matter how much storage Apple stuffs into the latest iPhone, your ever-growing music, photo, video, and app collections will max it out in no time. 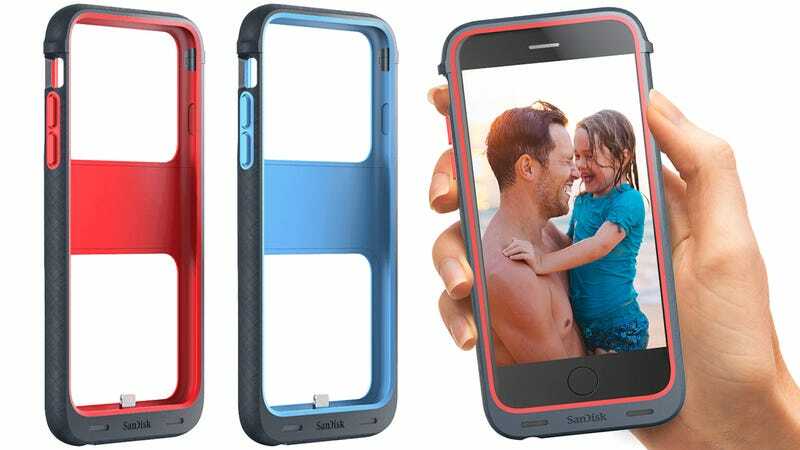 Instead of constantly having to delete files so you have room to keep adding new media, SanDisk’s new iXpand Memory Case will simply boost your iPhone’s storage capacity. Available in 32 GB, 64 GB, and 128 GB models for $60, $100, and $130, respectively, the protective iXpand Memory Case wraps around your iPhone 6 or 6 Plus and connects via its Lightning port. It doesn’t just magically boost your iPhone’s overall storage capacity, though. You’ll need to use a SanDisk app to take advantage of all that extra space. But as a bonus the case can be set to automatically back up your phone’s Camera Roll, and has options for protecting everything stored on it through encryption. There’s even a removable 1,900 mAh battery attachment available for $40, which allows the iXpand Memory Case to boost your iPhone’s run time in addition to its capacity for media. The new case is reminiscent of Mophie’s Space Pack, which provides both extra storage and extra battery life at the same time, but with less capacity on both fronts. And if you don’t want the added weight of an extra battery in your pocket, SanDisk’s iXpand can easily shed that extra power, without separating you from all of your files.